A strong mental attitude and plan are the key to your sporting success. Are you ready to get the tools and support you need to up your game? Working with a Mental Performance Coach can drastically increase confidence and consistency in performance to achieve your goals. Imagine having someone working with you that understands the mental strength needed and who is dedicated to helping you achieve your dreams. That is exactly what I do! 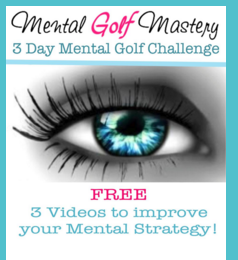 Mental Golf Mastery provides an assessment to look at your personality temperament to assist you with how you perform under pressure and what skills need to be strengthened to be a consistent performer no matter the circumstance. Check out the packages below. During our free phone consultation if you are unsure, we can discuss which option would be the best fit for you. Packages are cheaper, but Individual sessions are available for $300 per session. If you are having a specific problem you would like to work through: Fear/Phobia, anxiety, yips, negative thoughts, etc. This is for you if you know that you want to commit to Mental Performance Training to improve your game. This is for you if you know mindset is holding you back. Lay a solid foundation of Mental Skills Training and a system for your game. You know you want to integrate the Mental Performance Training on a deep level of performance. Great for the athlete that wants training pre and during the season. Everything we work on has to do with getting you to where you want to be in your golf game. Topics I work on with golfers include: overcoming fears/phobias and anxieties that hold you back, structure of your mental game, ability to engage focus, concentration and "the zone" at will, goal setting, focus, motivation, tools for managing performance anxiety, improving confidence, dealing with team issues, time management, competition preparation and debrief, etc. Through our conversations and homework (assignments of Mental Skills Training tools, interactive worksheets, hypnosis audios, brain rewiring exercising) you will start to build a solid foundation for building consistency with your mental game and performance. The wonderful thing is by working on your game in this way you will begin to notice changes in the rest of your life as well. Coaching sessions typically run from 45-60 minutes and can be either in person, video chat (Skype), or via phone. During our first meeting (This session is up to 90 minutes) we’ll talk about your sport history and your intention and goals for us working together. From there I’ll assess the best skills for us to work on in order to help you accomplish your athletic goals. Depending on the program that best fits your needs, we will work together once/week or every other week. Coaching sessions can also occur on location during training or competition.